Counter Arguments HOW IMPORTANT IS TOBACCO TO SMALL RETAILERS? Each year, smoking kills an estimated 15,000 Australians1 and costs Australia $31.5 billion2 in social (including health) and economic costs. Treasury has advised that tobacco clearances (including excise and customs duty) fell by 3.4% in 2013 relative to 2012 and fell a further 7.9% in 2014. Tobacco clearances have fallen a total of 11.0% since 2012 when tobacco plain packaging was introduced. These growth rates do not take into account refunds of excise equivalent customs duty made under Customs’ plain packaging related Tobacco Refund Scheme between December 2012 and May 2013. These refunds cannot be related to annual net clearances on a comparable basis to other data used to derive these growth rates. The tobacco excise rate was indexed to average weekly ordinary time earnings (AWOTE) from 1 March 2014 and there were two separate 12.5% increases in the tobacco excise rate (1 December 2013 and 1 September 2014). In relation to smoking rates, the Australian Government relies on data from national surveys conducted by the Australian Bureau of Statistics (ABS) and the Australian Institute of Health and Welfare (AIHW). On 17 July 2014, the AIHW released the 2013 National Drug Strategy Household Survey: key findings, which outlines the topline data for tobacco, alcohol and licit and illicit drugs. On 25 November 2014, AIHW’s National Drug Strategy Household Survey detailed report 20134 was released showing that there has been a significant decrease in daily smokers aged 14 years or older in Australia, falling from 16.6% in 2007, 15.1% in 2010 to 12.8% in 2013. Young people are delaying commencing smoking – the age at which 14 to 24 year olds smoked their first full cigarette increased from 15.4 years of age in 2010 to 15.9 years of age in 2013. The proportion of 12-17 years olds who had never smoked in 2013 remained high at 95%. The proportion of 18 to 24 year olds who have never smoked increased significantly between 2010 and 2013, from 72% to 77% respectively. People aged 18 to 49 years of age were far less likely to smoke daily than they were 12 years ago. The average number of cigarettes smoked per week has decreased from 111 cigarettes in 2010 to 96 cigarettes in 2013. 16.5% of smokers (14 years or older) reported using unbranded tobacco in their lifetime with 3.6% using unbranded tobacco (half the time or more) in 2013, declining from 4.9% in 2010. Dependent children are far less likely to be exposed to tobacco smoke inside the home, (2013, 3.7% compared to 1995 at 31%). These results do not reflect any impact from the Australian Government’s change to bi-annual indexation of tobacco excise or the first of four 12.5% excise increases on tobacco products which took effect on 1 December 2013. Aboriginal and Torres Strait Islander Australians aged 14 years or older were two and a half times as likely as non-Indigenous Australians to smoke daily in 2013: 32% (Indigenous compared to 12.4% (non-Indigenous). The proportion of Aboriginal and Torres Strait Islander Australians aged 14 years or older smoking daily declined from 35% in 2010 to 32% in 2013, and the number of cigarettes smoked per week declined significantly, from 154 in 2010 to 115 in 2013. People aged 14 years or older, living in remote and very remote areas, were twice as likely to have smoked daily in the previous 12 months as those in major cities: 22% compared with 11.0%. The proportion of people aged 14 years or older smoking daily rose with increasing remoteness: 11.0% in major cities; 15.4% in inner regional; 19.4% in outer regional; and 22% in remote and very remote areas. People (14 years or older) living in areas with the lowest socioeconomic status (SES) were 3 times more likely to smoke daily than people with the highest SES, 19.9% compared with 6.7%, but there were significant declines in daily smoking in both these groups between 2010 and 2013. The declines in daily smoking seen nationally were also seen among employed people but there were no significant changes in the smoking behaviour of unemployed people who were unable to work between 2010 and 2013. People aged 14 years or older, who were unemployed were 1.7 times more likely to smoke daily and those who were unable to work were 2.4 times more likely to smoke daily. Compared to 2010, employed people aged 14 years or older were less likely to smoke daily in 2013, down from 16.1% to 13.5% respectively. The ABS Australian Health Survey: Updated Results, 2011-12 were released on 30 July 2013 and reported that in 2011-12, 16.3% of Australians aged 18 years and older smoked daily (age standardised). The ABS Australian Aboriginal and Torres Strait Islander Health Survey: Updated Results, 2012-13 (AATSIHS) were released in June 2014. The final results of the survey were based on the full Indigenous sample of around 12,900. The Report shows that 42% of Indigenous Australians aged 15 years and over smoked daily. Between 2002 and 2012-13, current daily smoking rates for Indigenous Australians aged 15 years and over declined significantly by 7 percentage points. The combined middle age group, 25 to 34 year olds, had the highest daily smoking rate, 51.5%. In 2012-13, the proportion of Aboriginal and Torres Strait Islander people aged 15 years and over who were daily smokers was higher in remote areas than in non-remote areas, 50% compared with 39%. This pattern is evident for all age groups. 2012-13, 48% to 39% respectively. This has not been mirrored in remote areas. The daily smoking rate of Indigenous Australians aged 15 years and over remained stagnant at 50% between 2002 and 2011-13. Consistent with the decreases in current daily smoking rates between 2002 and 2012-13, the proportion of ex-smokers, aged 15 years and over, increased from 15% to 20%. The proportion of Aboriginal and Torres Strait Islander people, aged 15 years and over, who said they had never smoked increased from 33% to 36%. For young people aged 15-17 years, the proportion who had never smoked increased from 61% in 2002 to 77% in 2012-13. For those aged 18-24 years, the proportion who had never smoked increased from 34% to 42% over the same period. Australia’s low smoking rate is the result of sustained, concerted and comprehensive public policy efforts from all levels of government and action from public health organisations. 2015 and 2016 – remaining 12.5% excise increases on 1 September each year. through the achievement of these aims in the long term, as part of a comprehensive range of tobacco control measures, contribute to efforts to reduce smoking rates. Tobacco plain packaging operates as part of a comprehensive set of tobacco control measures. It is an investment in the long term health of Australians and its full effects will be seen over the long term. Question: Have tobacco sales increased since the introduction of tobacco plain packaging on 1 December 2012? Question: Are Australia’s tobacco plain packaging laws having an impact on smoking rates in Australia? Over the past 40 years, Australian Governments have implemented an increasingly progressive range of tobacco control measures including advertising and promotion restrictions, education campaigns, bans on smoking in enclosed and public spaces, excise increases, quitlines, graphic health warnings and tobacco plain packaging, which together have worked to cut smoking rates in half. In relation to smoking rates, the Australian Government relies on data from national surveys conducted by the Australian Bureau of Statistics and the Australian Institute of Health and Welfare. The Australian Institute of Health and Welfare’s, National Drug Strategy Household Survey detailed report 2013 released on 25 November 2014, shows smoking rates have significantly fallen for people aged 14 years or older from 15.1% in 2010 to 12.8% in 2013 and for people aged 18 years or older from 15.9% in 2010 to 13.3% in 2013. The report and online tables are available from the AIHW website. Question: What is the evidence for the introduction of tobacco plain packaging? Tobacco plain packaging is based on a broad range of studies and reports, and supported by leading Australian and international public health experts. Extensive research evidence to June 2009 in support of tobacco plain packaging is set out in the reports of the National Preventative Health Taskforce, a group of Australia’s leading public health experts. The report of the Taskforce is available on the Preventative Health Taskforce website. The research shows that industry branding and packaging design can mislead about the harmful effects of the product, reduce the effectiveness of graphic health warnings on tobacco products, and increase the appeal of tobacco to young people. Question: Have any early impacts of tobacco plain packaging been identified? A recent observational study of the prevalence of cigarette pack display and smoking in outdoor venues before and after the introduction of tobacco plain packaging and larger graphic health warnings, indicate a decline in apparent active smoking rates and personal pack display (packs clearly visible on tables) among patrons. Research has also found a significant increase in the number of calls to the smoking cessation helpline, Quitline, in NSW and the ACT. The research showed a 78% increase in the number of calls to the Quitline associated with the introduction of plain packaging. This peak occurred four weeks after the initial appearance of plain packaging. This research also found the increase in calls was sustained and was not attributable to anti-tobacco advertising activity, cigarette price increases, nor other identifiable causes. The effect of tobacco plain packaging, as part of Australia’s comprehensive package of tobacco control measures, will be seen over the longer term. In particular, by reducing the appeal of tobacco products and preventing consumers being misled about the harms of tobacco products, it is anticipated that tobacco plain packaging will have an impact on uptake of smoking by youth, and will encourage existing smokers to quit and stay quit. 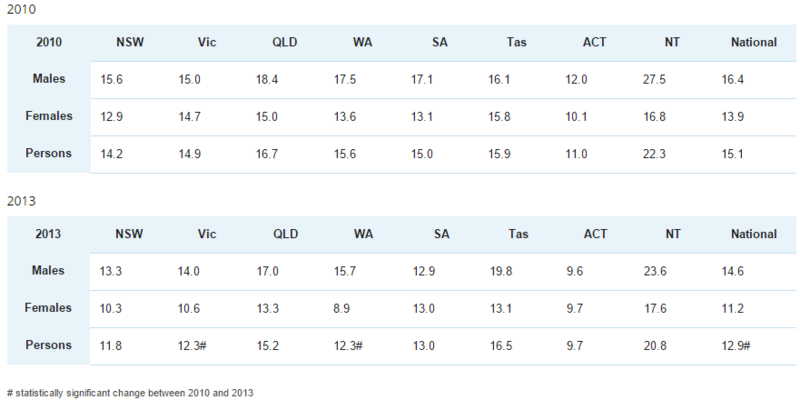 Question: Figures quoted in the press suggest that smoking rates have increased in New South Wales and South Australia. A major Australian daily newspaper reported that ‘Last year’s NSW population health survey, released last month, showed 16.4 per cent of all adults in the state smoke, up from 14.7 per cent in 2011′. From 2002 to 2011, when the methodology changed, the long-term trend in smoking in NSW had been downwards. As outlined in Table 3, smoking rates in NSW have fallen from 14.2% in 2007 to 11.8% in 2013. A major Australian daily newspaper reported that ‘ in South Australia (smoking) rates were up from 16.7 per cent to 19.4 per cent over the past year’. These statistics, which were released by the South Australian Minister for Health, are to be understood in the context that the state government ceased all expenditure on social marketing in June 2013 after a period of strong investment. There is a solid research evidence base about quality social marketing as part of a comprehensive approach to tobacco control. In recognition of this fact, and following the release of the latest smoking data, the South Australian Health Minister, Jack Snelling MP, stated in May 2014 that the State Government will re-instate $1.1 million a year in anti-tobacco mass media campaigns. Question: Will funding continue for anti-smoking social marketing activity in 2013-14? The Department of Health is well placed to undertake social marketing activities and is responsible for delivering the National Tobacco Campaign – More Targeted Approach, which targets hard to reach audiences and high prevalence smoking groups, including Aboriginal and Torres Strait Islander peoples. On 31 May 2014, World No Tobacco Day, the Government announced an injection of $4.6 million to the More Targeted Approach Campaign in 2013-14. As outlines in Table 3, smoking rates in South Australia have fallen 15.0% in 2007 to 13.0% in 2013. Question: Will funding for Quitline services for Aboriginal and Torres Strait Islander peoples continue? All Quitline services targeting Aboriginal and Torres Strait Islander peoples continue – there have been no cuts. 1. Begg S., Vos T., Barker B., Stevenson C., Stanley L., and Lopez AD., (2007) The Burden of Disease and Injury in Australia 2003, PHE 82 Canberra: Australian Institute of Health and Welfare, p76. 2. Collins D., and Lapsley H., (2008) The Cost of Tobacco, Alcohol and Illicit Drug Abuse to Australian Society in 2004/05, Commonwealth of Australia, Department of Health and Ageing, Monograph Series No.64, p65. 5. National Drug Strategy Household Survey 1991, 1993, 1995, 1998, 2001, 2004, 2007, 2010 and 2013. 8. For 2001, 2004-05 and 2007-08 – ABS, 4125.0 – Gender Indicators, Australia, July 2012. 8. ABS Australian Health Survey: Updated Results, 2011-12 (AHS), released 30 July 2013, Table 13.3, Selected health characteristics with age standardised proportions – 2001 to 2011-12. 9. ABS, Aboriginal and Torres Strait Islander Health Survey: Updated Results, 2012-13 – Australia, released 6 June 2014. Table 10.3 Smoker status by age. 10. Data age standardised to the 2001 Australian Estimated Resident Population.